Olympic National Park: Quinault Rain Forest, March of the Maples! 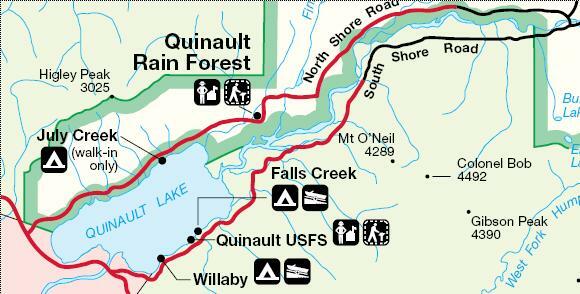 Lake Quinault and its rain forest is on the southwestern boundary of the Olympic National Parl. The battle of Hoh Rain Forest has been decidedly won by the Firs. At Lake Quinault, the Maples have the upper hand. Maples spread out at the top and let sunlight in for many things to grow at their feet. The firs grow closely together so that their sparse foliage above when massed together doesn't let anything too large get a toe hold below. ...Continue reading "Olympic National Park: Quinault Rain Forest, March of the Maples!" 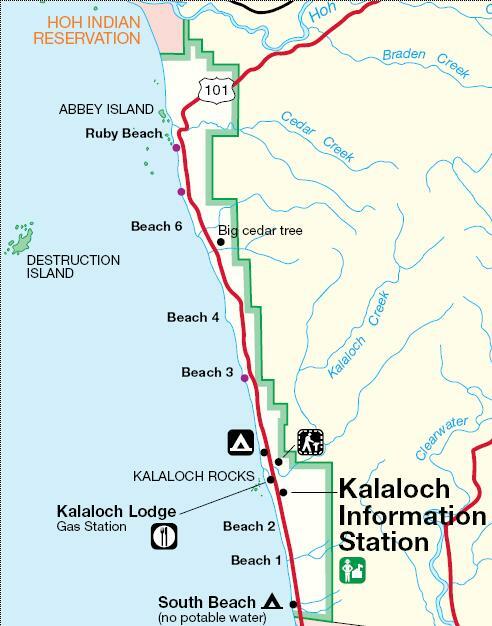 Olympic National Park: Did the beaches drive them mad? I have often said that it was my first glimpse of Mount Rainier as I drove across the I-90 bridge for the first time in August of 1982 that instilled a yearning within me to move to the Pacific Northwest. I have never heard that from anyone else that I have ever met. However, several people have told me (one a prominent NW blogger) that seeing Ruby Beach for the first time did that very thing for them. Ruby Beach is on the far west of the west coast of the Washington peninsula. And the viewpoint to the beach does present one of the most picturesque images of the ocean anywhere in the world. ...Continue reading "Olympic National Park: Did the beaches drive them mad?" The Hoh River Rain Forest is located directly on the west end of Olympic National Park. Going here is like visiting another world. my friends to this other world? Nurse logs lay down, die. 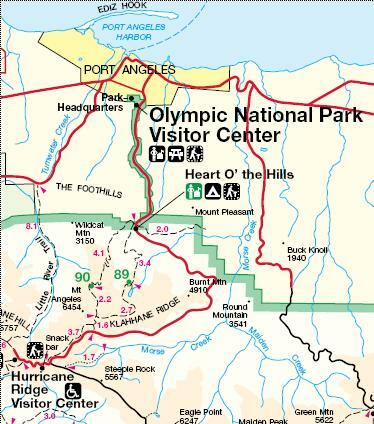 ...Continue reading "Olympic National Park: Hoh River Rain Forest Haiku"
West of Hurricane Ridge lies Lake Crescent. Lake Crescent is one of the most memorable sights you will ever see - part of it is the fjord-like ascents that surround it - but mostly it is the incredible color gradient that goes from emerald to royal - and sometimes it seems that there is no end to the depths. When you hear the legends and stranger than truth facts about this eight mile long lake, the mystery deepens. ...Continue reading "Olympic National Park: Lake Crescent"
Based on a couple of questions - let's do a little reset here. The 'edges' of the park are accessible by road - in some cases they are forestry roads and a four wheel drive vehicle is a good idea. The Hurricane Ridge Visitor Center is about an 18 mile drive south and southwest up to a viewpoint area where there are several trailheads - it is at 5240 feet of elevation. The sights at Hurrican Ridge are the subject of this post. 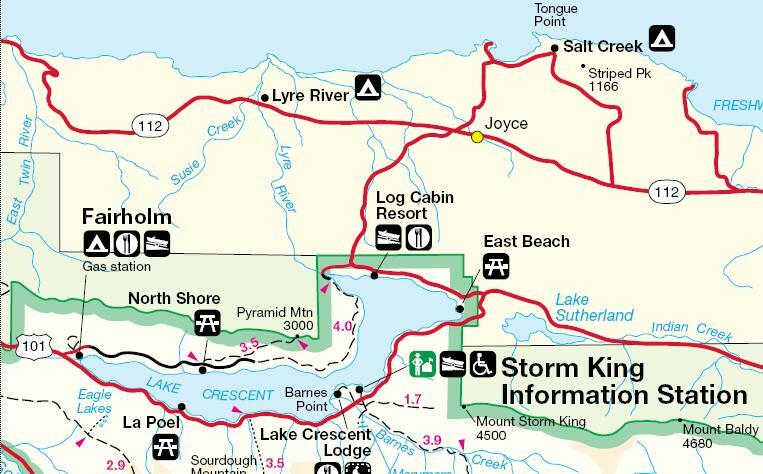 ...Continue reading "Olympic National Park: Hurricane Ridge"
Made a trek to the Olympic peninsula on Sunday and most of Monday. 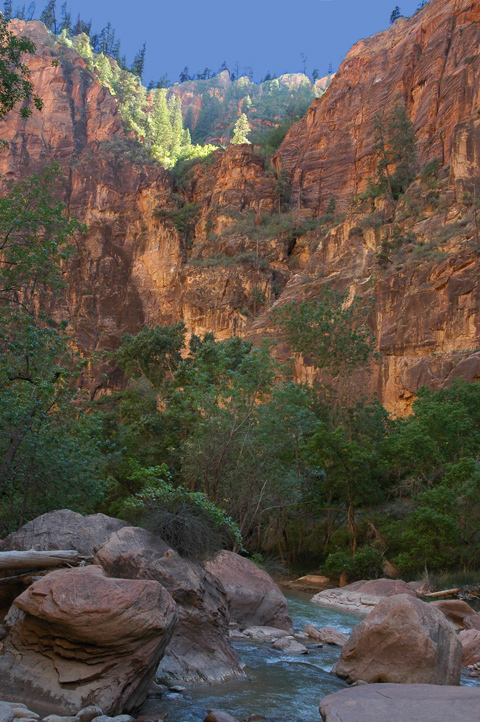 I'll put a post up for the next several days representative of different areas of the park. Not everyone is aware that Washington state is home to three national parks - all within reasonable driving distance from anywhere in western Washington. I've shown you some pictures of Rainier - that's perhaps most well known. 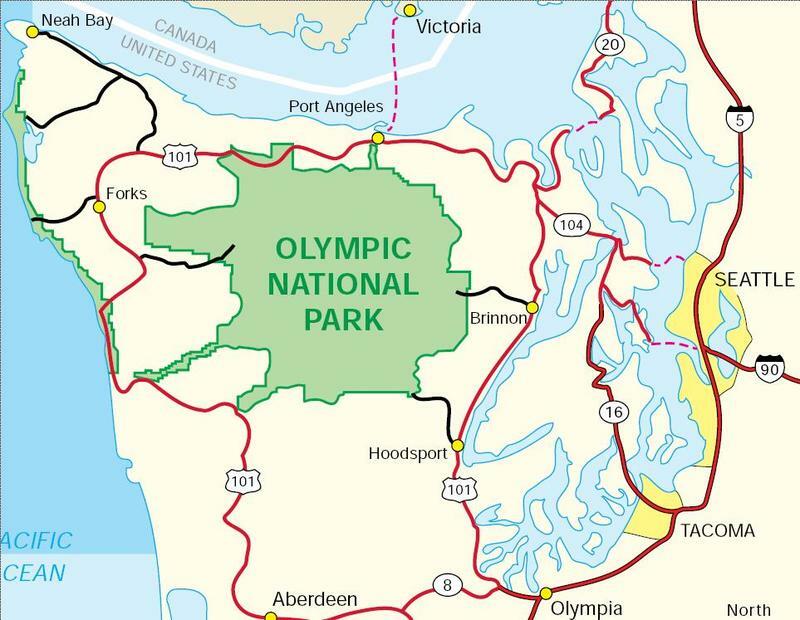 Almost the entire peninsula west of Puget Sound is the Olympic National Park. Travel from Seattle or any points east, north, or south of there benefit from a ferry ride to the peninsula. ...Continue reading "Olympic National Park: Edmonds to Kingston to Hurricane Ridge"
In a brilliant strategic move, it was announced today by the Immigration and Naturalization Service (INS) that the United States will cede part of the state of Texas, including the cities of El Paso and San Antonio to Mexico immediately. "We have long wrestled with the immigration issue that we have with Mexico", said an INS spokesperson. "While this may seem to some as a capitulation to the problem, we have really turned the tables on the Mexican government - because it is now incumbent on them to provide an infrastructure that will create an environment that is attractive to those who, until now, have been occupied with crossing the border into the United States to seek a better life." "Part of the issue is that this land - in fact, most of Texas, New Mexico, Arizona, and California - was taken by force from Mexico during an agressive, expansionist phase of US history", the spokesperson added. "Recognizing that we really have no right to this land anyway - and that it is almost totally occupied by illegals, we thought it was high time to quit claim to it." the spokesperson added. During the press conference, the spokesperson, using a flip chart with a map of Texas, explained: "The shaded area represents about 65,000 square miles which is roughly equivalent in percentage to the total US land mass as the Gaza Strip area recently ceded by Israel is to that nation. This is really a small price to pay for the ultimate resolution to the immigration problem." "Every citizen of the United States that lives in this area must leave their homes in the next week" said the spokesman, adding: "Anyone who does not leave of their own accord, will be evicted - by force if necessary. We recognize that this will be a painful process for some of our fellow Americans - but in the end, it is in the public's greater interest for this to happen." Asked by a reporter about the Administration's involvement, the spokesperson stated: "The Administration has nothing to do with this. The INS on its own initiative obtained a state court order based on the recent SCOTUS Kelo decision and has declared this area the property of Mexico by exercise of eminent domain. The people need to realize that no referendums are needed, and no involvement by the other estates of government are required when the public good is at stake." Asked by another reporter about the fact that, unlike Israeli settlers, US citizens have the right to keep and bear arms, and how that might impact the process, the spokesman said: "We will meet any resistance with a more than equal share of force. For those who lay down their weapons, our agents will enter their premises unarmed and carry them sweetly and with great empathy from their homes. For those who take up arms, we have more arms, and tanks if necessary to insure that the evictions take place. Ultimately, Americans have become sheep anyway. Sure, they may whine about this for a few days, they'll write their screed on their blogs, but, like the Kelo situation, when the time comes, they'll comply like the docile lambs that they have become." The reporter who asked that question was unceremoniously taken from the press conference and mercilessly beaten to death by INS agents. No further questions were asked. "Finally", added the spokesperson, "we are certain that the Mexican government can take this land and, once it has been raized, create a socio/economic utopia that will, for all of its citizens who have hitherto sought to leave their mother country for the true motherland of the north, provide a true homeland that will also attract all of the other Hispanic population throughout the United States. We know that this will ultimately be seen as a final solution to the immigration problem." If what is happening in the Gaza strip were happening anywhere else in the world, it would be decried for the lunacy that it is. There is no special Holy Land dispensation for appeasement. Appeasement never works. Never has. Never will. UPDATE: Almost singular in agreeing with my argument, Robert Spencer of Jihad Watch offers these insightful updates from Palestine (Hamas) and Iran. It is sadly interesting that most conservative politicos in the US are, in effect, siding with Tehran on this issue. If you haven't been following it yet, Michelle Malkin and Brian Maloney are exposing progressive Air America's growing scandal. Now that's a tag team you wouldn't want to be on the other side of. It is also blog journalism in its finest hour so far. This is pretty heart wrenching. Imagine that 32 years ago you left a good life to embrace a hard one - and now the government is throwing you out of your home. Don't think it can happen? It's happening in Gaza right now. I've been watching in complete shock on Fox News here very early this morning as Israeli soldiers - many of them weeping at the task before them - are forcibly removing people from their homes. I captured a little of one situation where soldiers used sledge hammers to batter down the door of a home filled with people - men, women, and children. Click on the picture to the left (requires MS Media Player) and watch as, in another testament to why Thomas Jefferson thought it was so very important that the people keep and bear arms, a family is completely helpless in the face of eviction from their home. While this situation is different than Kelo - Israel is ceding land and its citizen's homes to a foreign power, apparently for the opportunity to have terrorist aggression even closer to their country - it is a stark reminder of what governments think they are in the position of executing against the lives of their citizens. We should certainly hold the people of Gaza in our prayers during this time.